Can sprinklers cause water damage? The short answer is, absolutely. Most people think of water damage as being caused by heavy rains from storms, burst pipes or overflowing bathtubs. However, there are instances where sprinkler system problems can cause water damage in area homes. Complete Clean Water Extraction is a local, trusted water damage restoration company, and we’ve seen it all. If you are experiencing water damage, call now for swift action. Has a Pipe Burst in Your Sprinkler System? If you have had the interior of your home flood due to a broken irrigation pipe, immediate action is required in order to minimize the water loss to your property. First, turn the water off, then call (210) 239-0486 and the restoration pros at Complete Clean Water Extraction will be there in minutes to secure the affected areas, remove any standing water and begin the drying out process. Complete Clean Water Extraction will get to work on your water before the water gets to work causing structural damage to your property! Broken Pipes: Sprinkler systems do tap into your home’s water line. If the sprinkler pipes become damaged, or frozen, the water can easily flood the interior of your building. Broken Sprinkler Heads: This is a common cause of flooding. Sometimes, a geyser occurs too close to the foundation of a home, and water can seep into the concrete. Improper System Installation: Irrigation system provide water to all the zones of your yard via underground pipes that connect to your water line. If pipes run too close to the foundation and leak, you may end up with a slab leak. User Error: Not properly setting up a timer or installing a rain sensor can lead to pooling water in your yard, which can seep into your foundation. Most people think of flood damage as happening in the winter months when pipes freeze, or in the spring when the rains come and rivers flood. Another frequent type of call we get happens when basements are filling with water after a sprinkler line bursts. Often, homeowners don’t initiate a system check for problems when the begin watering their lawns in the spring. 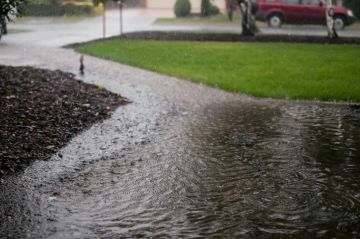 Before long, some will notice a river running right through their yard and collecting at their home’s foundation. When sprinklers run overnight, water can be collecting for many hours before the problem is noticed. Aside from user error, sprinklers can also cause basement flooding when sprinkler heads malfunction or water lines break. When the lines are too close to the home’s foundation, seepage can occur, which is especially damaging if your basement is finished. If your basement if flooding, regardless of the cause, call (210) 239-0486 ASAP to dispatch the skilled water damage crew from Complete Clean Water Extraction.